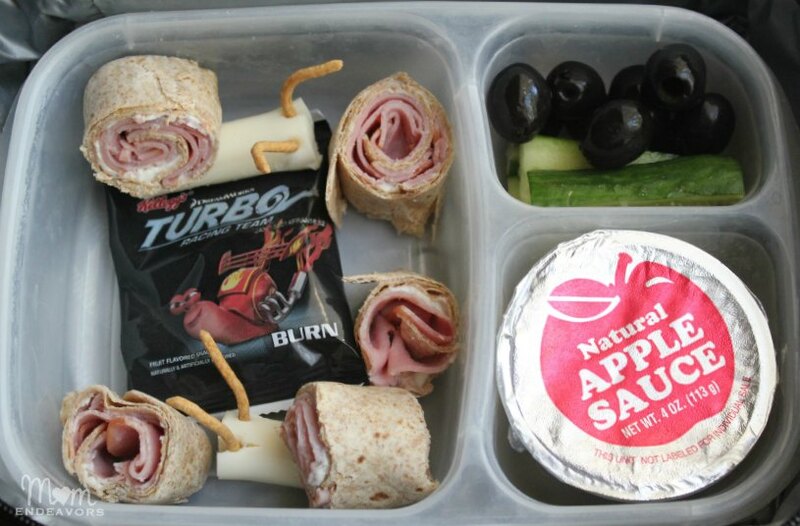 Fun TURBO Snail School Lunch Idea! If you’ve been a reader of the blog for a while, then you know that I love getting creative with food! So, it’s been fun to come up with simple, yet fun ideas for Big Brother’s school lunches! We started off the school year with a fun Star Wars themed lunch (complete with lunch box printables) and we ended the second week with a fun TURBO snail themed lunch! Sooo fun! Suffice it to say that this was a HUGE hit! And, it was actually really easy to put together! With making his lunches, I’m all for creative things that don’t take a lot of extra time! 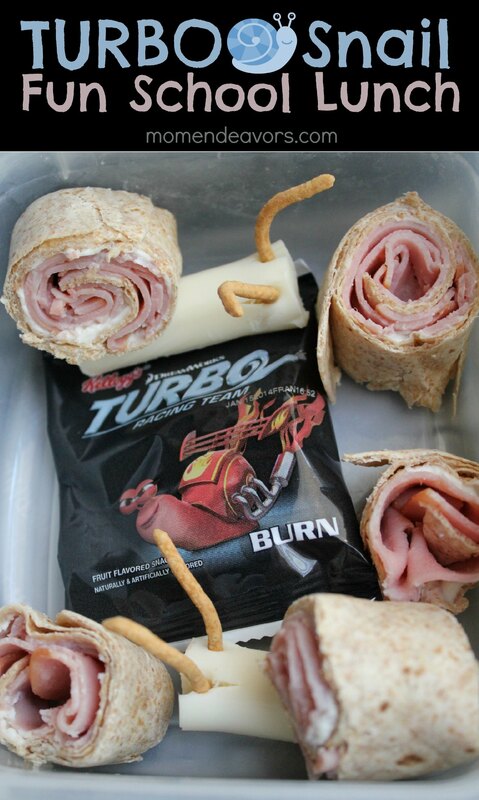 This TURBO lunch definitely fit into that creative, yet easy category! To make your “snails”, just spread some Laughing Cow Cheese or cream cheese on a tortilla and top with ham. Roll up the tortilla, then cut into approximately 1″ sections. Cut a string cheese in half and use a toothpick to attach the tortilla “snail shell” to the sting cheese (just worn your kiddo about the toothpick!). For antennae, stick in a couple of chow mein noodles. Sides for this can be anything you’d like. If you’ve seen TURBO the movie, then tomatoes would be a cute side! But, you can see the only theme thing I did with it was the TURBO fruit snack. The other sides are just some cucumber sticks & black olives, with a container of no sugar added apple sauce. Super easy! It barely took 5 minutes to make and was such a hit with Big Brother! Would YOUR kiddo enjoy a snail lunch? !